(CelebrityAccess News Service) – Hot Club of Cowtown, whose new HighTone Records release is Continental Stomp, began last year’s European push as street performers in France. By the end of the year, they were being included on one of Britian’s most highly rated television programs and are now being asked by promoters to return. 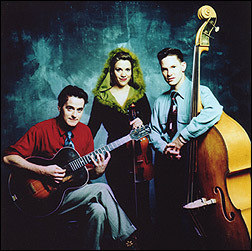 The trio of acoustic musicians (Elana Fremerman, Whit Smith and Jake Erwin), whose sound combines precise small-band hot jazz with Western Swing, paid an impromptu visit to France during the Cannes Film Festival. They had no dates booked, choosing instead to take their act to the sidewalks and playing for anyone who would listen. Soon after, they were back touring in Norway and later, joined a sold-out tour with The Mavericks in the UK. In November, they appeared on the prestigious BBC program, Later with Jools Holland. The response there was overwhelming, and Holland extended an invitation three weeks later to appear on his highly-rated BBC program, New Year’s Eve Hootenanny. Hot Club of Cowtown was the only American band invited to perform on the program, which included Paul Rodgers, Shane McGowan, Desmond Dekker, Primal Scream, JuniorSenior and Texas.